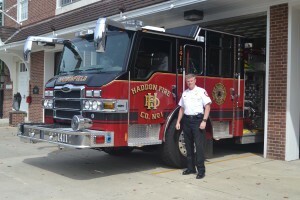 Operating since 1764, Haddon Fire Company №1 has been acknowledged as being the second-oldest volunteer fire company in continuous service in the United States. The 252-year-old fire company is holding its 50th Fire Prevention Night, inviting residents for a fun and educational night all about fire prevention. The event will be held on Thursday, Oct. 13 at the Haddon Fire Company №1 firehouse, 15 S. Haddon Ave., from 6 p.m. to 9 p.m.
“We’ve been doing the Fire Prevention Night here for 50 years, and the company has been in service for over 250 years. It’s been an open house to the public, educating and promoting fire safety. It’s a milestone,” Fire Chief Sam Trotman said. Each year since 1922, Fire Prevention Week is observed on the Sunday through Saturday period in which Oct. 9 falls. Fire Prevention week was started after the Great Chicago Fire in 1871. The fire occurred Oct. 8 and roared through northeast Wisconsin for two days. On the 40th anniversary of the Great Chicago Fire, the Fire Marshals Association of North America, today known as the International Fire Marshals Association, decided the anniversary should be observed in a way that would keep the public informed about the importance of fire prevention, according to the National Fire Protection Association. The commemoration grew incrementally official over the years. In 1920, President Woodrow Wilson issued the first National Fire Prevention Day proclamation and established Fire Prevention Week in 1922. Haddon Fire Company №1 commemorates the week each year with a Fire Prevention Night, always filled with fun for children, such as fire engine rides, hands-on displays and goodies, as well as adults with live demonstrations, hands-on activities and informational pieces. The fire company has these fun activities to provide education as well. “Kids will get the chance to use the fire hose, and adults will get the chance to learn how to use a fire extinguisher and the protocols behind it,” Trotman said. This year will also include a visit from the U.S. Forestry Service, an educational demonstration on electrical panels by PSE&G and a number of pamphlets, flyers and coloring books all about fire safety. The museum, featuring antique hand pumps, leather buckets, old uniforms and more will be open to the public as well. On location will be Haddonfield police, a possible K-9 unit, Haddonfield Fire Explorers from the high school and Haddon Fire Company firefighters. The explorers and firefighters will be recruiting people who are interested into volunteering. New this year are a coloring contest sponsored by The Haddonfield Sun together with the Haddon Fire Company, a live trashcan fire controlled by the fire company and a new fire extinguisher prop the company got for such demonstrations. Refreshments will be available as well, and everything is free to the public. 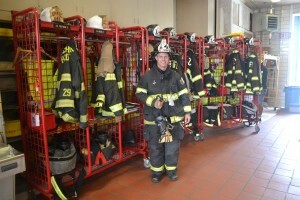 “This is about the fire department giving back to the public,” Trotman said. He said some major safety tips this year are about early notification and smoke detectors. According to Trotman, many people think if you see a fire, you’re supposed to immediately try to put it out. However, the correct protocol is to call 911 for notification, get everyone to a safe area and then, if safe and possible, try to put out the fire with an extinguisher. “The main thing is don’t try to fight it and lose. Call 911, grab everyone and go outside because that is minutes that go by we could’ve been on the road and responding. Early notification for us is the key, as fire doubles every minute,” Trotman said. Smoke detector replacement is the big safety tip for Fire Prevention Week this year. Home and business owners are reminded to check the date of manufacturing of their smoke detector. If it is more than 10 years old, it needs to be replaced. Throughout the week, the Haddon Fire Company will be sure to promote these tips, as well as tips for Haddonfield’s younger residents. The company is going to the local pre-Ks and elementary schools to check the fire safety of the schools and talk about fire prevention to the students during Fire Prevention Week. Residents are recommended to follow Haddon Fire Company №1 on Facebook for safety tips throughout the year and other events it will be having or taking part in. On Oct. 29, there will be a car safety check behind Borough Hall as part of the Safe Kids Program at Cooper University Hospital. To register for a time, call (856) 429–4308.